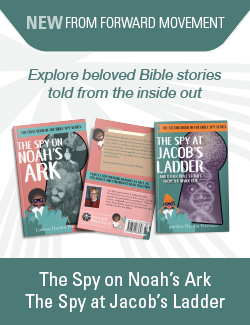 This post is republished with permission from Emily Grace Watkins’ blog. – Ed. As I was discovering the church year and beginning to practice it, I was a graduate student in Canada. I loved that the Canadian Thanksgiving was in October, because, honestly, I struggled with the fast turn around from American Thanksgiving to Advent. I love Thanksgiving, but Advent always starts a few days later and I just couldn’t seem to flow from one to the other. Either Thanksgiving (aside from the feast) was ignored and Advent prepared, or we’d focus on giving Thanks and Advent traditions started a week late. However, this has changed in recent years. There are two reasons for this. The first (and less interesting reason) is simply that I’m no longer building traditions in the same way I was in the early years of parenting. Yes, I’m always scheming and adding things to our seasons as my Pinterest boards attest. But, if I did nothing before the first day of Advent this year I could pull out a box marked “First Week of Advent.” I would unpack a few items and we would be off and running in a matter of minutes. Advent is the beginning of church year, which means late November is the end of the year; it is a perfect time to reflect on all that we have been given and experienced in the past year. I think ending the year with grateful heart is ever so much more important than ending it with resolutions. In this light, ending the year with a feast of Thanksgiving and the Feast of Christ the King (a day to give thanks for the most precious gift of the Son and his reign) is so wonderfully fitting. 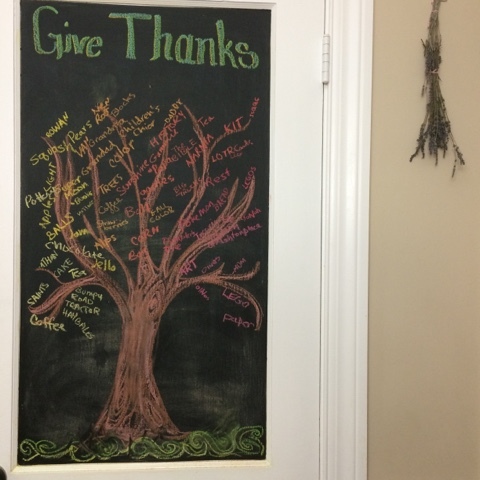 Last year I didn’t get my branches out for a gratitude tree, but instead used the chalkboard I painted in our kitchen to make a tree of Thanks. I’m loving it and the boys are too. It isn’t anything spectacular, but for the sake of sharing the idea, here is last year’s Gratitude Tree. Thanks! This idea definitely helps manage the quick transition. We don’t have children living with us now, but love to get Advent calendars for the grandchildren and great-grandchildren when they visit. I’m always scrambling to get my Advent inspirational reading material ready so I can digest it and meditate right from the beginning. These posts are helpful with that, also.